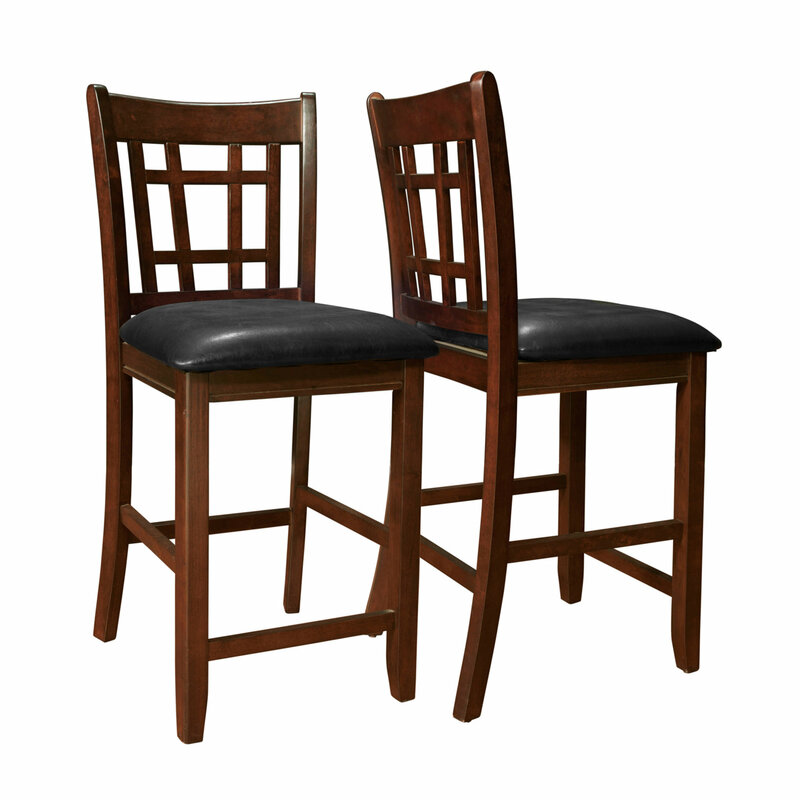 Take casual dining to a whole new level with these counter height leather look stools. Built for comfort with a padded seat and back and a well positioned footrest for stability, these stools offer contemporary appeal that will provide years of lasting enjoyment. 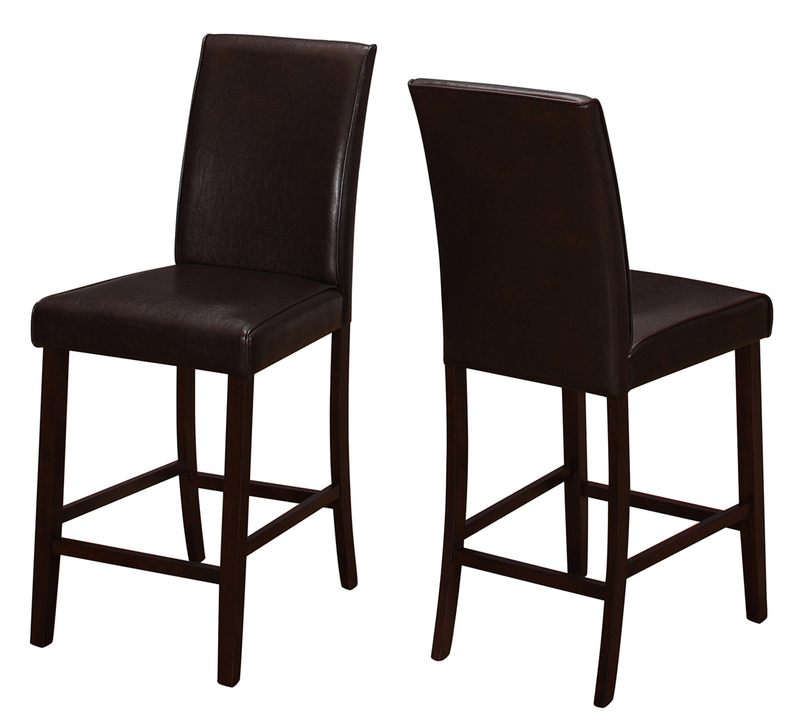 Upholstered in a rich brown easy care material, these stools are ideal for your kitchen, breakfast bar or loft. This AmeriHome Metal Dining Chair Set in Silver is durable enough for use in the shop, and stylish enough to use in the kitchen, game room, bar, basement, dorm room, or loft. The Dining Chairs have a modern, industrial style, with clean lines and a simple elegance, which will look great in the dining room or on the patio. The chairs arrive fully assembled, so they are ready to use as soon as they arrive. Lightweight and sturdy, each chair weighs only 12 lbs., but is strong enough to hold up to 530 lbs. Each Metal Dining Chair has a brace under the seat that provides additional support and stability. No-mar rubber feet keep them from sliding and scratching hardwood floors. The Dining Chairs are painted a metallic silver with a scratch-resistant powder coat paint finish. 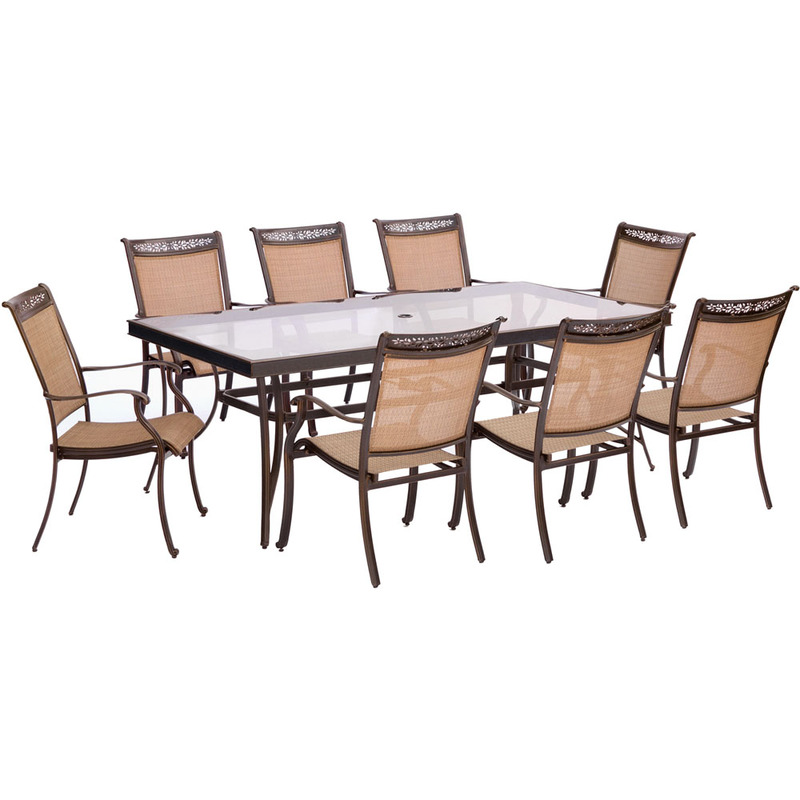 Each Dining Chair stands 30.75 inches tall with a seat height of 17.5 inches from the floor. Sold in a set of 2. Weight Capacity: 530 lbs., each chair weighs 12 lbs. Bring a touch of modern elegance into your home with the clean design of this set of 2 contemporary black leather-look dining chairs. Featuring a comfortably padded seat and back and sleek sturdy chrome metal legs, these chairs will easily have you dining in style. Seat dimensions: 15"W x 17"D; Seat height: 18"
Add some modern industrial charm to you dining room or kitchen with the AmeriHome Loft Rustic Gunmetal 4 Piece Metal Dining Chair Set with Wood Seats. 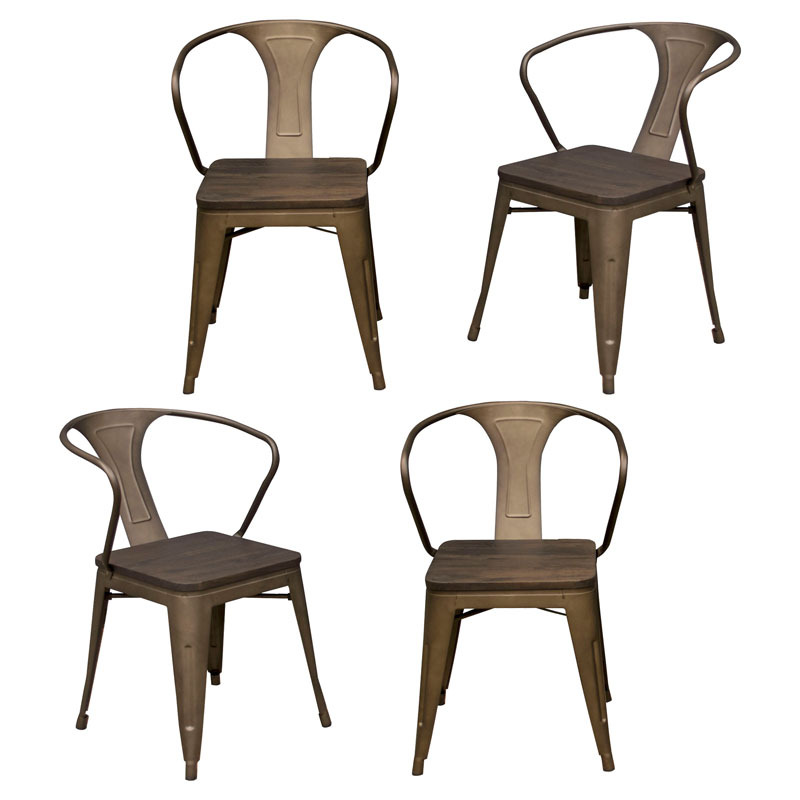 The dark elm wood seat gives these Dining Chairs a sophisticated look without being too fussy. 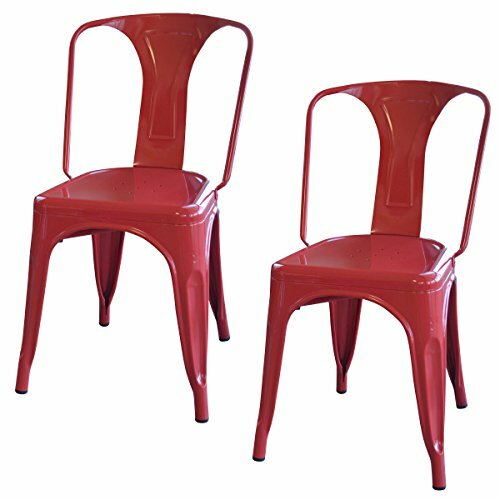 The armrest and backrest have been engineered for maximum comfort; so your family and friends can sit comfortably sit long meals relaxing meals. Scratch resistant powder coat paint finish is durable and stylish enough to use in the kitchen, game room, bar, basement, dorm room, or loft. Lightweight and sturdy, each Chair weighs only 15 lbs., but can hold up to 530 lbs. 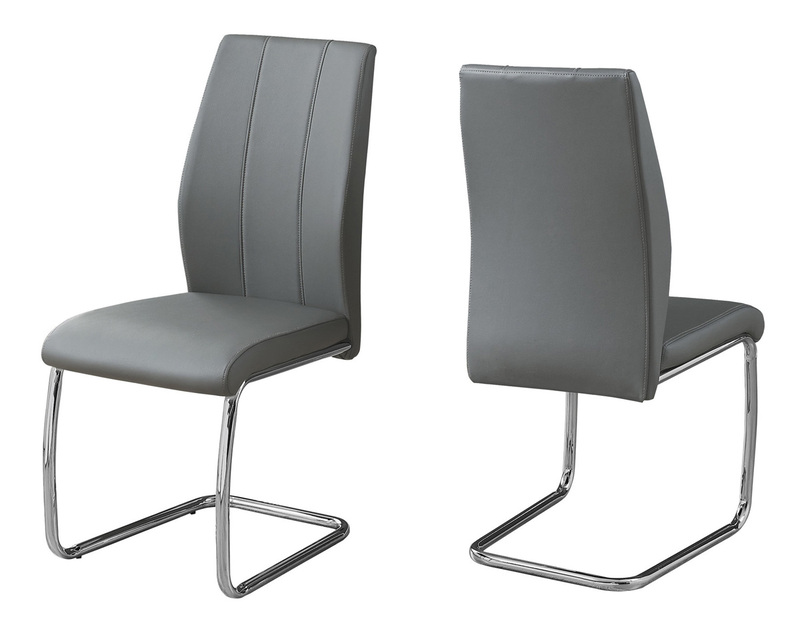 Each Metal Dining Chair has a brace under the seat that provides additional support and stability. No-mark feet keep them from sliding or scratching hardwood floors. Each Chair has a seat height of 18 inched from the floor, and an overall height of 31.5 inches. Dark elm wood seat is 15.25 x 15.25 in. The unique and beautiful color if the frame really set these Wood Top Dining Chairs apart from others. The Rustic Gunmetal is the color of aged and weathered bronze. A metallic java finish that is polished to a light gloss, and almost shimmers in the light. The smoky espresso color is rich, complex, and beautiful. Sold in a set of 4, each chair weighs 15 lbs. Bring a touch of modern elegance into your home with the clean design of this set of 2 contemporary grey leather-look dining chairs. Featuring a comfortably padded seat and back and sleek sturdy chrome metal legs, these chairs will easily have you dining in style. 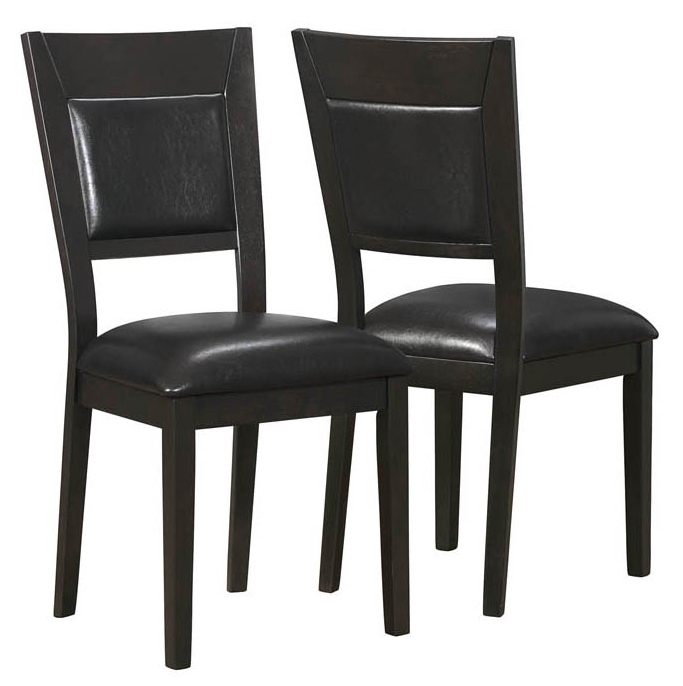 With modern style at its finest, these chairs will help create a luxurious feel to your dining room. 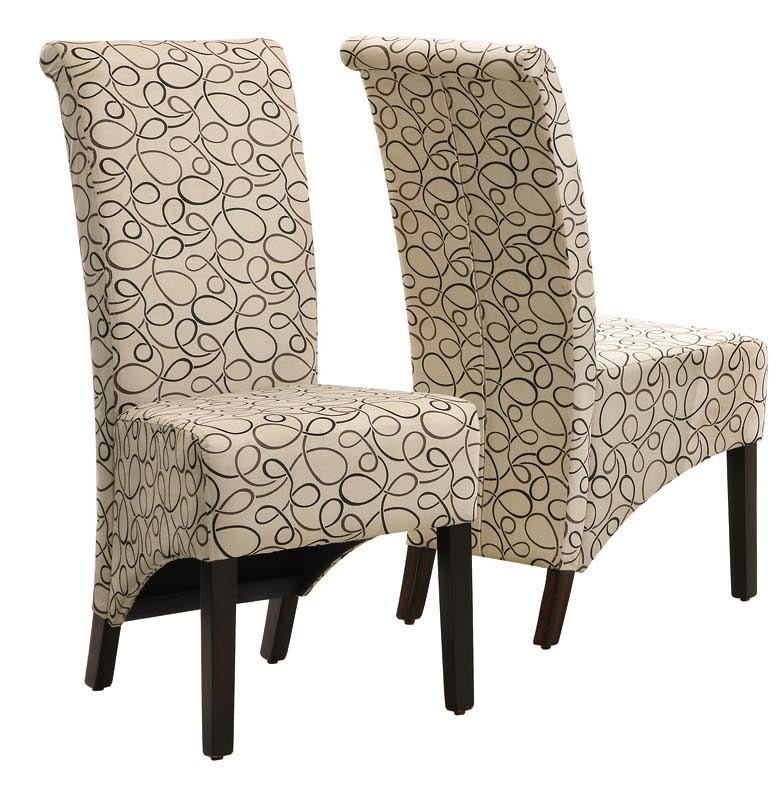 These tan swirl fabric covered chairs include high backs designed for your comfort and convenience. The 40 " high Parson chair has cappuccino stained, solid wood legs. They will definitely be the topic of discussion and center of attention at all your casual or formal gatherings. 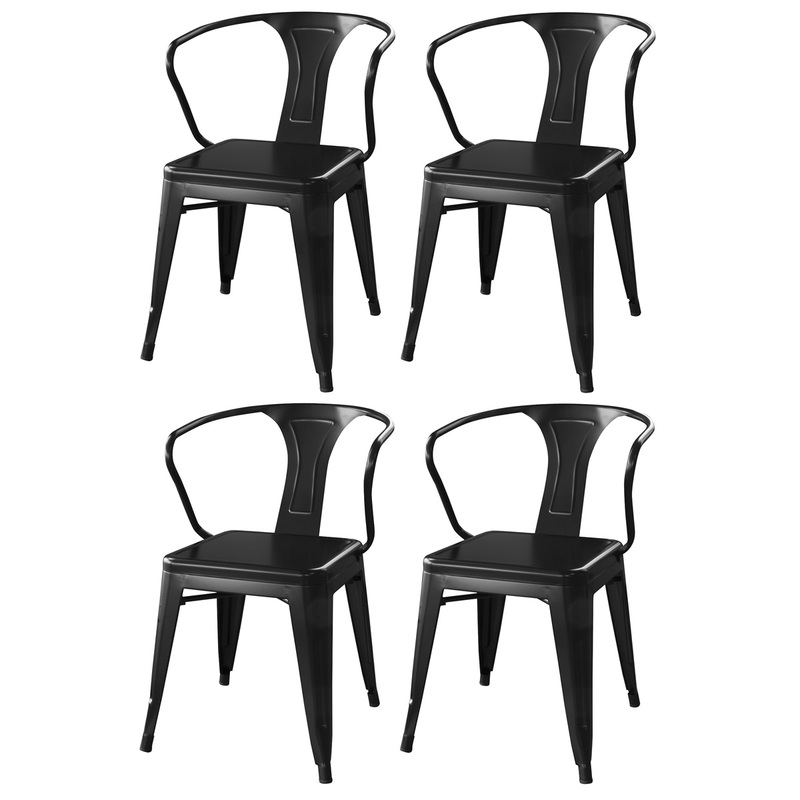 Add some modern industrial charm to you dining room or kitchen with the AmeriHome 4 Piece Loft Black Metal Dining Chair Set. These Dining Chairs have a sophisticated look without being too fussy. The armrest and backrest have been engineered for maximum comfort; so your family and friends can sit comfortably sit long meals relaxing meals. Scratch resistant powder coat paint finish is durable and stylish enough to use in the kitchen, game room, bar, basement, dorm room, or loft. Lightweight and sturdy, each Chair weighs only 15 lbs., but can hold up to 530 lbs. Each Metal Dining Chair has a brace under the seat that provides additional support and stability. No-mark feet keep them from sliding or scratching hardwood floors. Each Chair has a seat height of 18 inched from the floor, and an overall height of 31.5 inches. Dark elm wood seat is 15.25 x 15.25 in. 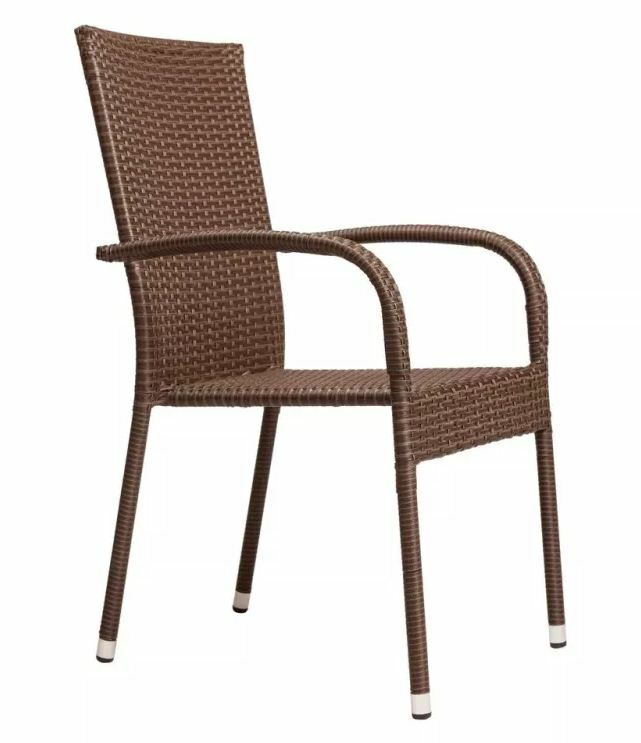 Add versatile outdoor seating for dining, chatting, or relaxing poolside with the stackable Morgan Outdoor Wicker Side Chair from PatioSense. Lightweight for easy compact storage and re-arrangement. Hand-woven all-weather-wicker construction is right at home indoors or out. 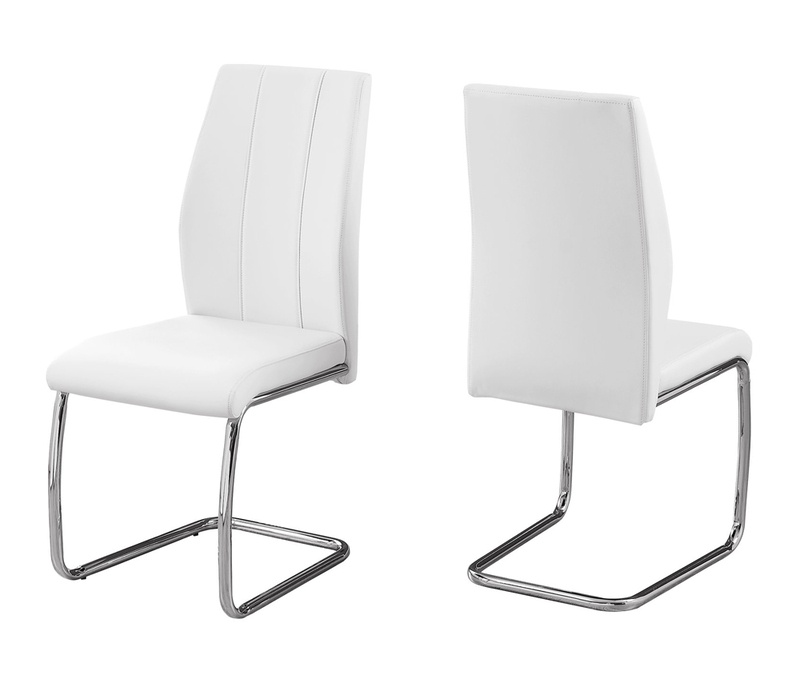 Bring a touch of modern elegance into your home with the clean design of this set of 2 contemporary white leather- look dining chairs. 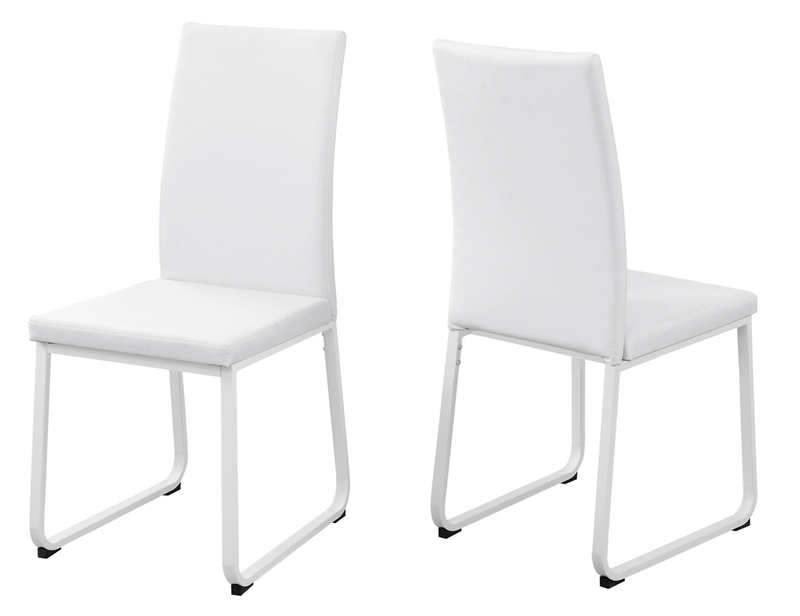 Featuring a comfortably padded seat and back and sleek, sturdy satin white metal legs these chairs will easily have you dining in style. 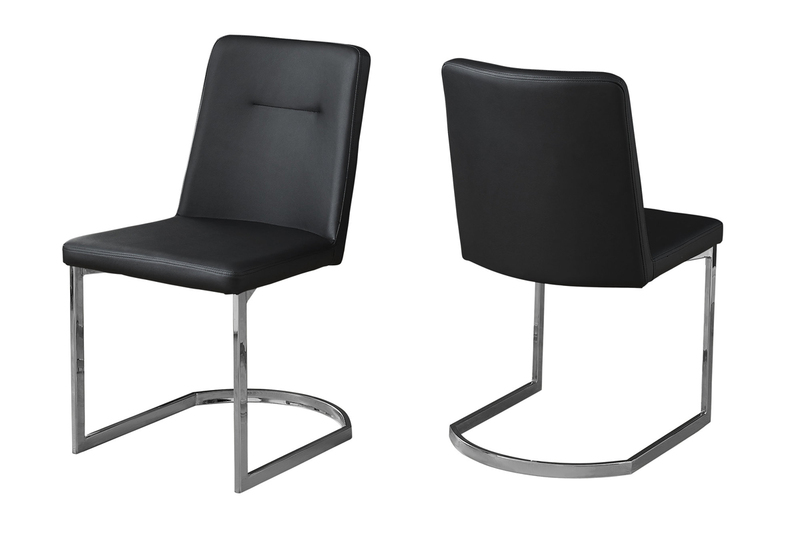 Seat dimensions: 15"W x 17"D x 21"H (back rest); Seat height: 18"
Bring a touch of modern elegance into your home with the clean design of this set of 2 contemporary black leather- look dining chairs. 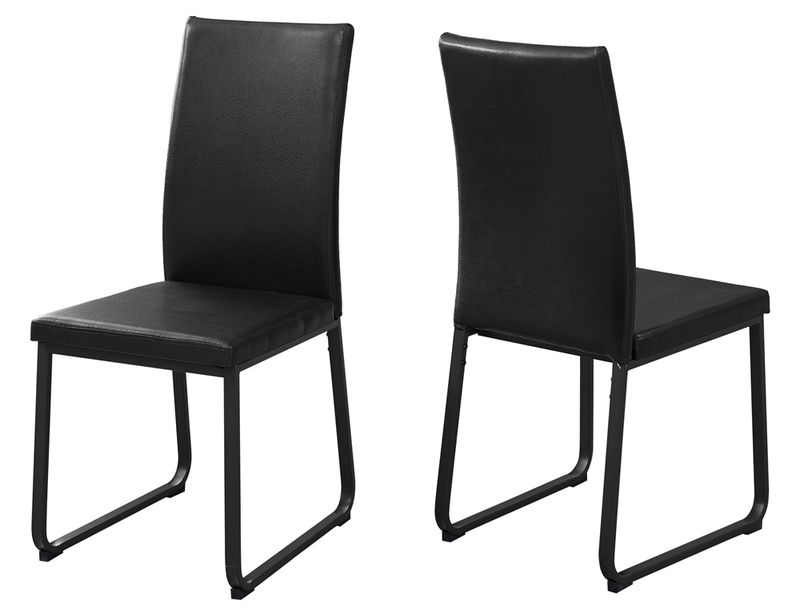 Featuring a comfortably padded seat and back and sleek, sturdy satin black metal legs these chairs will easily have you dining in style. These stylish side chairs compliment the look of the dining table with generously padded cushioning ,leather look upholstery and matching dark cappuccino finish. 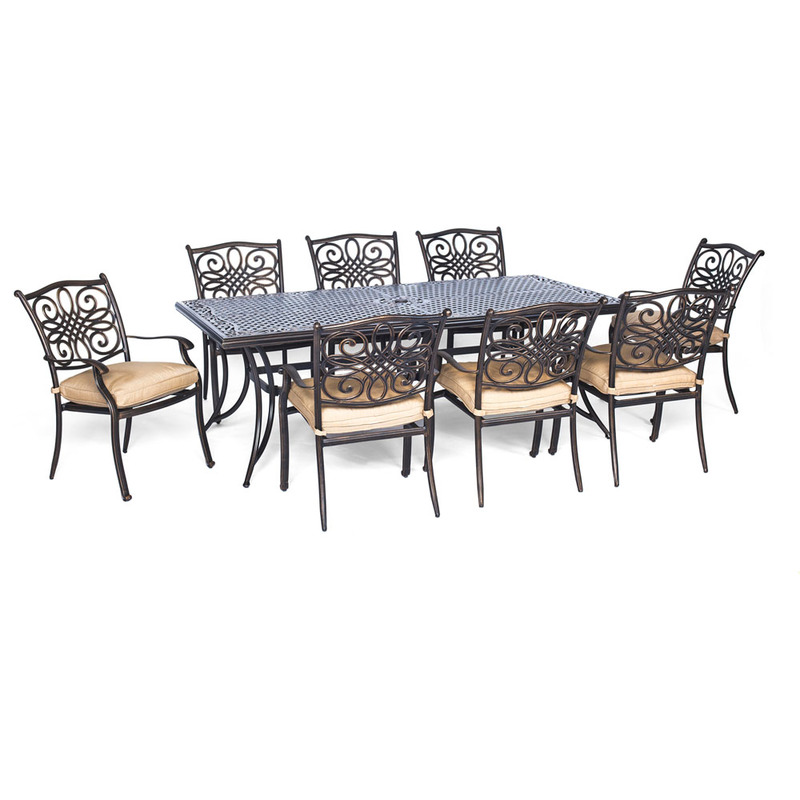 Built for comfort and convenience these chairs undeniably add to the appeal and character of the dining set. 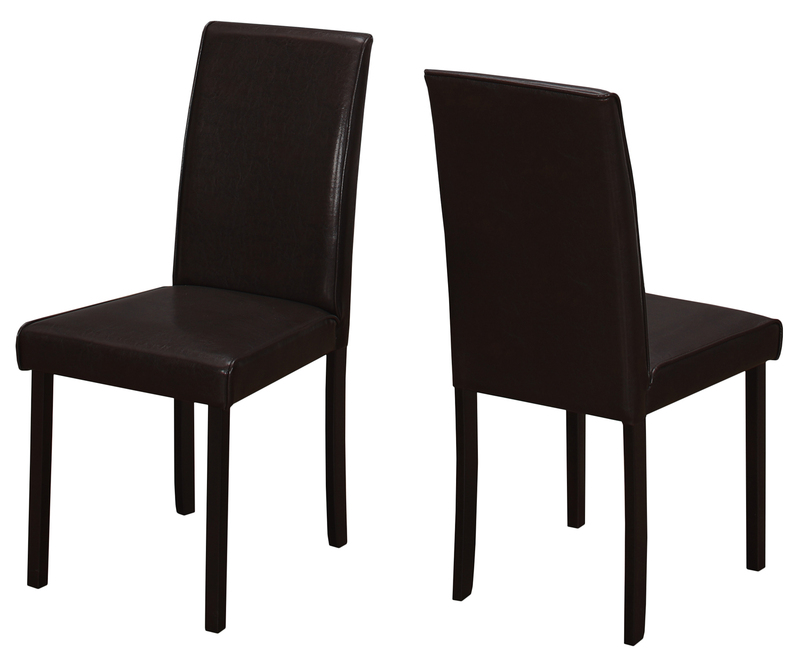 Create a casual, modern fashion statement in your dining area with these dark brown, leather-look dining chairs. Featuring generously padded cushioning and an easy to clean leather look upholstery these dining chairs are built for comfort and convenience. Seat height: 18"H, Seat dimensions: 17"x17"
Create a casual, modern fashion statement in your dining area with these ivory, leather-look dining chairs. Featuring generously padded cushioning and an easy to clean leather look upholstery these dining chairs are built for comfort and convenience. Take casual dining to a whole new level with these counter height leather look stools. Built for comfort with a padded seat and back and a well positioned footrest for stability, these stools offer contemporary appeal that will provide years of lasting enjoyment. 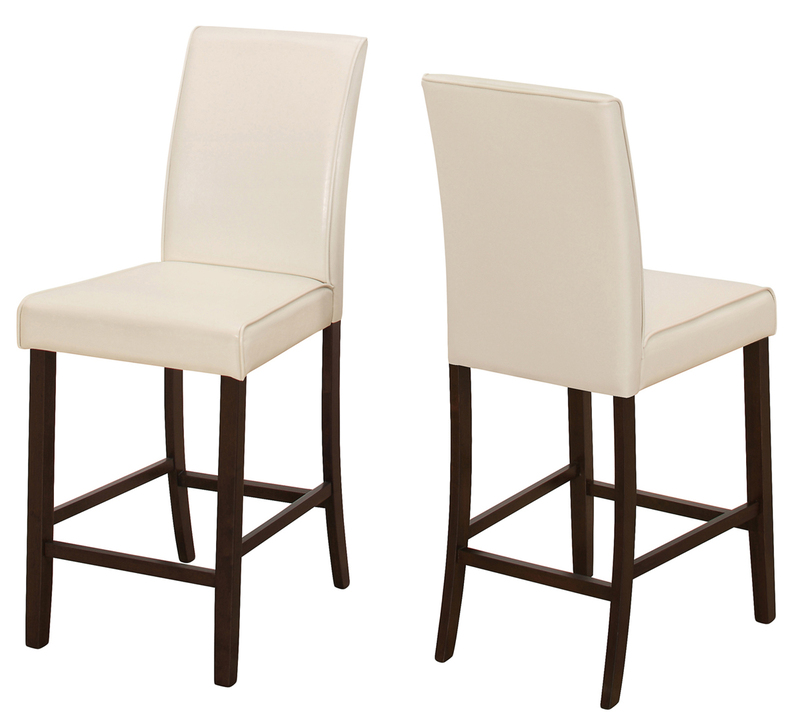 Upholstered in an ivory easy care material, these stools are ideal for your kitchen, breakfast bar or loft. 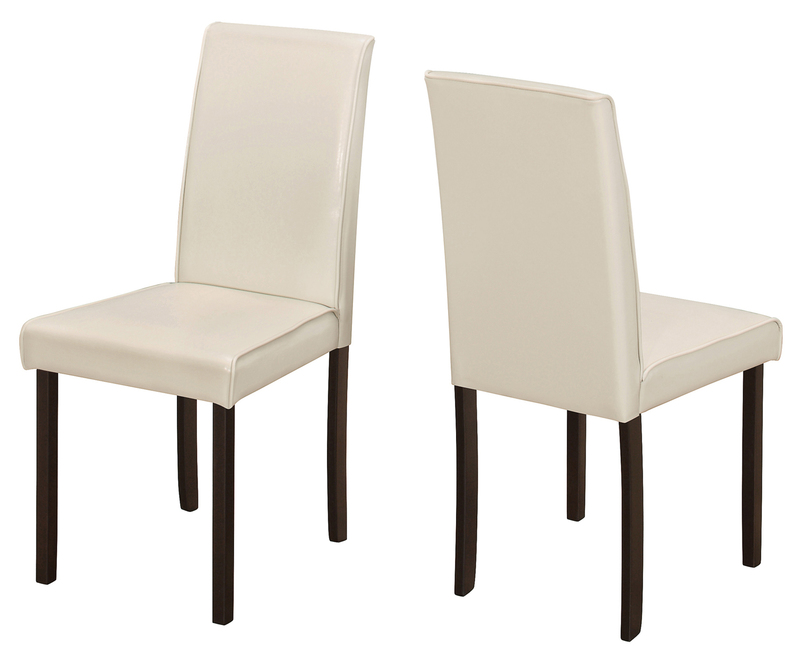 These cappuccino dining chairs will look wonderful in your casual contemporary dining room. 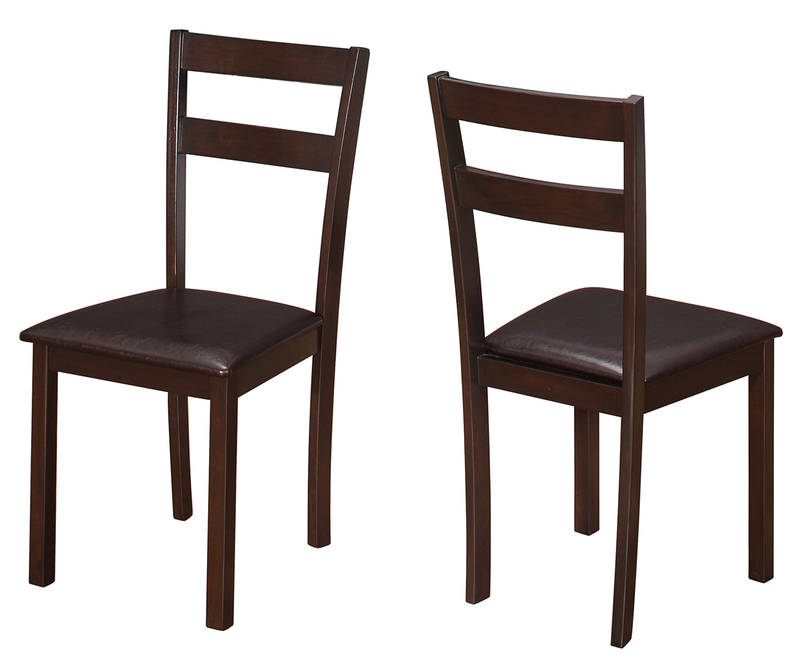 With comfortaby padded dark brown leather look seats, a slight horizontal slat back design, and sleek tapered legs these dining chairs will create a warm and inviting ambiance in any home. Bring a touch of modern elegance into your home with the clean design of this set of 2 contemporary white leather-look dining chairs. Featuring a comfortably padded seat and back and sleek sturdy chrome metal legs, these chairs will easily have you dining in style. 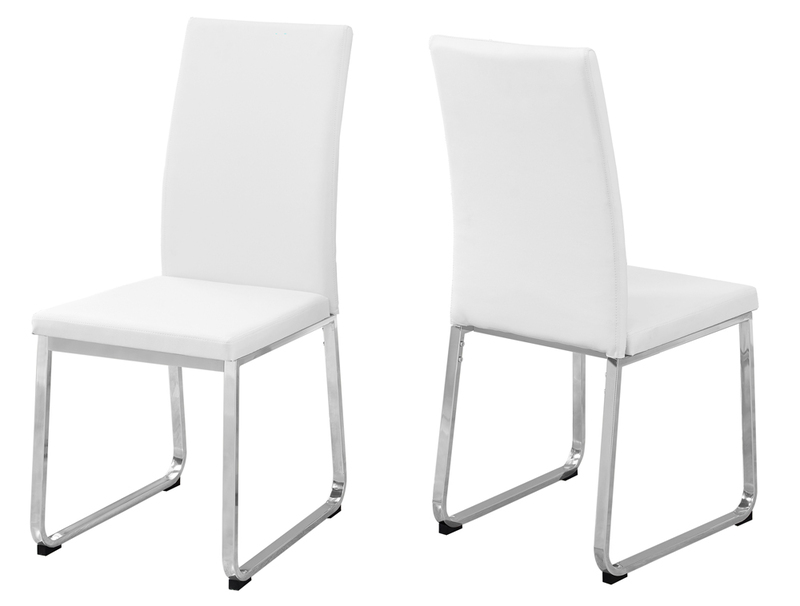 The clean modern lines of this set of 2 side dining chairs will instantly revive your dining space. 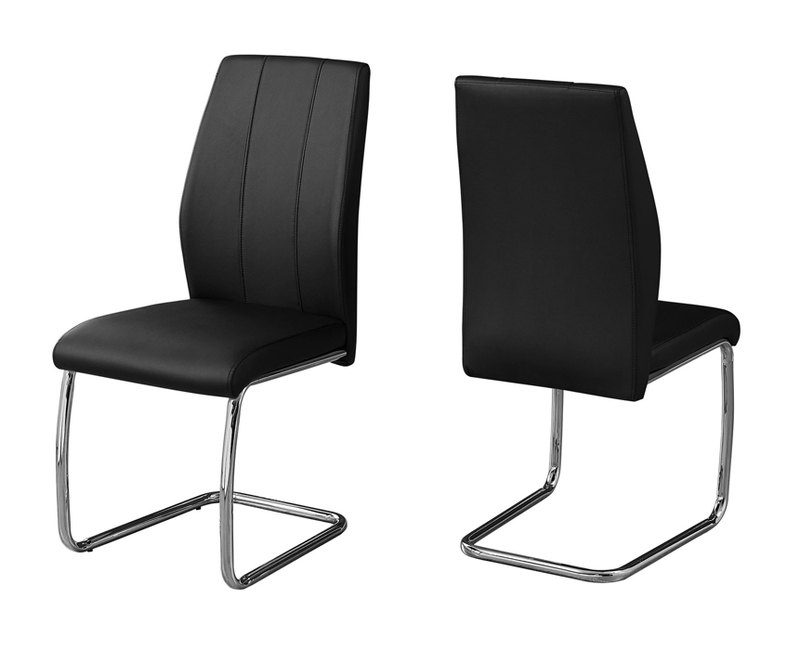 The chairs are upholstered in a sleek black leather-look material for easy maintenance. 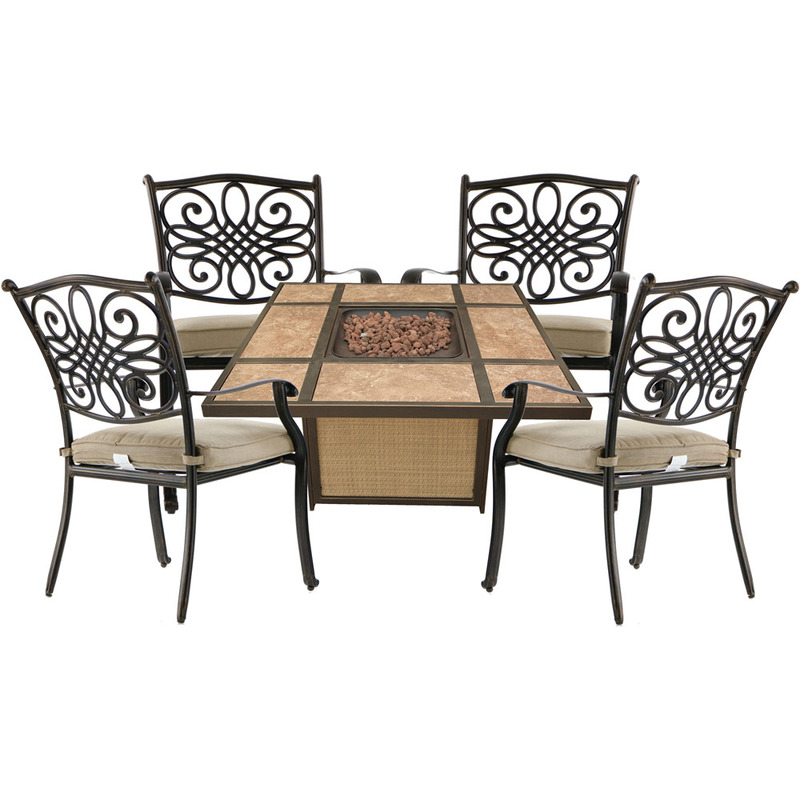 With a luxuriously comfortable curved back accented with 2 vertical rows of stitching, cushioned seat, and a sturdy u-shaped chrome metal base you will be dining in style in no time! Mix and match with one of our contemporary style tables to complete the set. Assembly is required. Take casual dining to a whole new level with these counter height leather look stools. Built for comfort with a padded seat and back and a well positioned footrest for stability, these stools offer contemporary appeal that will provide years of lasting enjoyment. 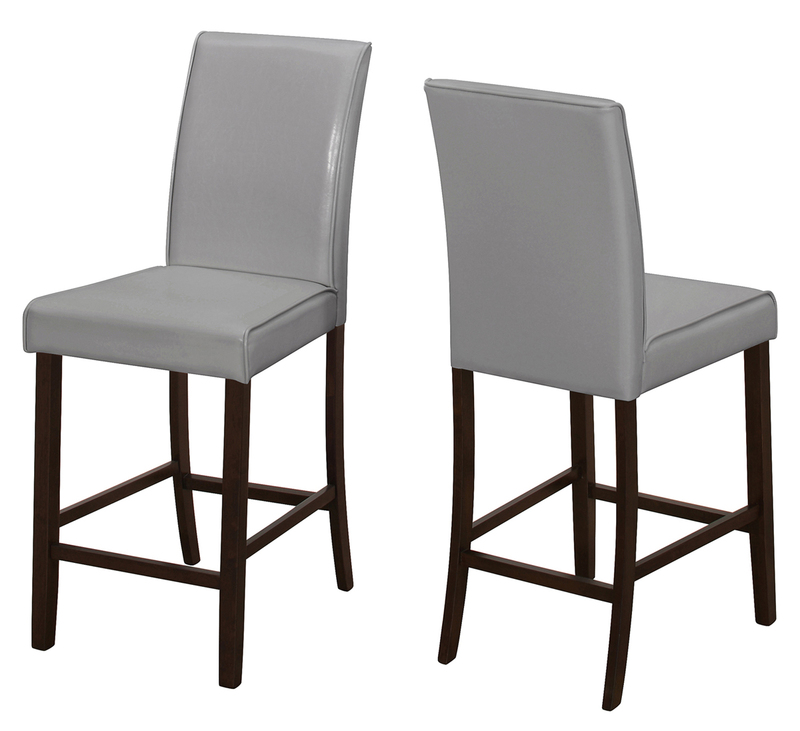 Upholstered in a grey easy care material, these stools are ideal for your kitchen, breakfast bar or loft. The clean modern lines of this set of 2 side dining chairs will instantly revive your dining space. 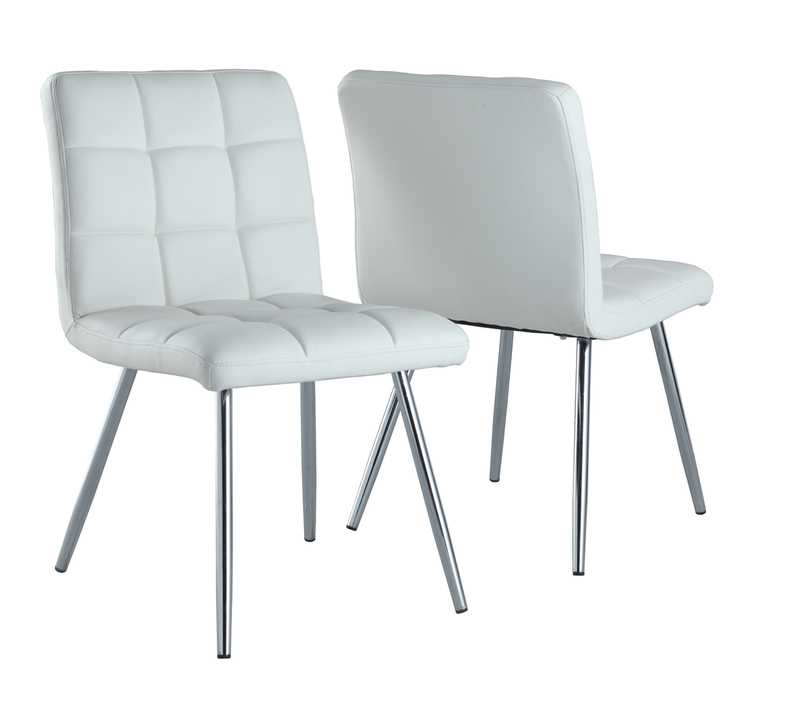 The chairs are upholstered in a sleek white leather-look material for easy maintenance. 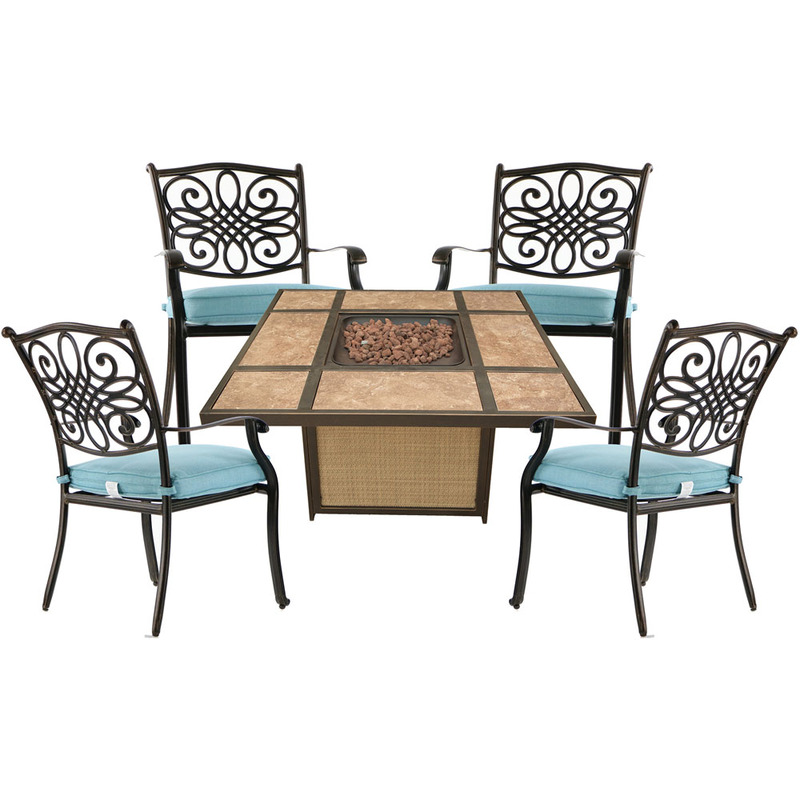 With a luxuriously comfortable curved back accented with 2 vertical rows of stitching, cushioned seat, and a sturdy u-shaped chrome metal base you will be dining in style in no time! Mix and match with one of our contemporary style tables to complete the set. Assembly is required. 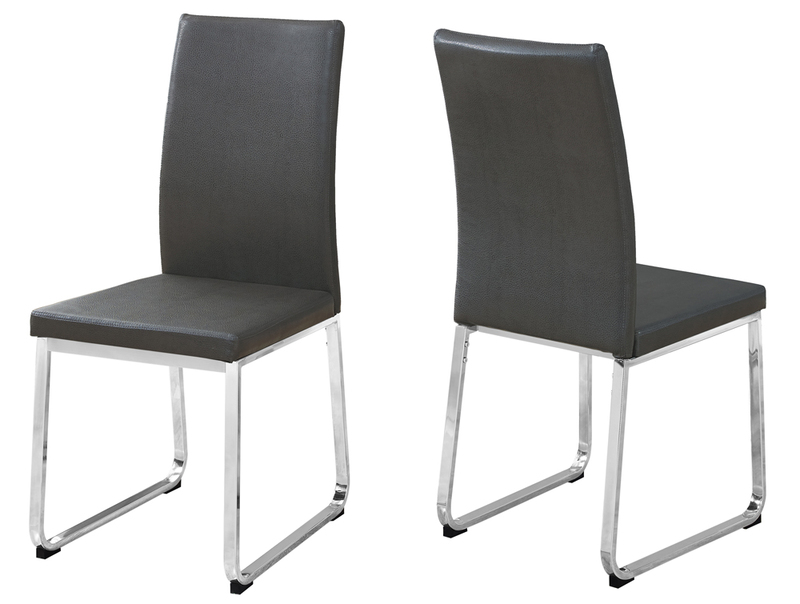 This set of 2 modern low back profile dining chairs in a simple, sleek design give an understated elegance to a dining space. 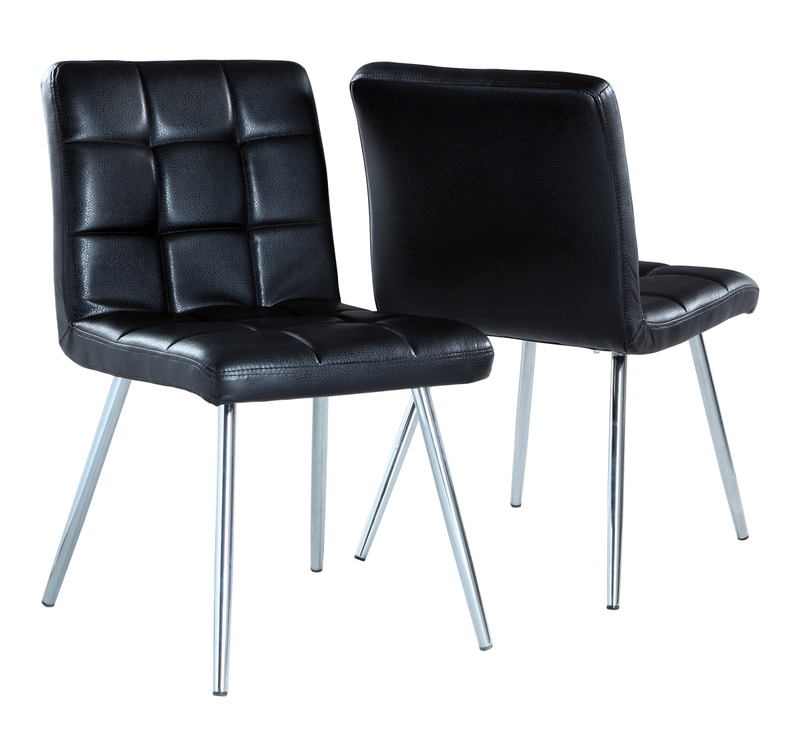 Upholstered in an easy-care black leather-look material, these chairs are complimented with a sturdy u-shaped contemporary chrome metal base, a thick cushioned seat and a curved back accented with a simple horizontal line of stitching across the center. 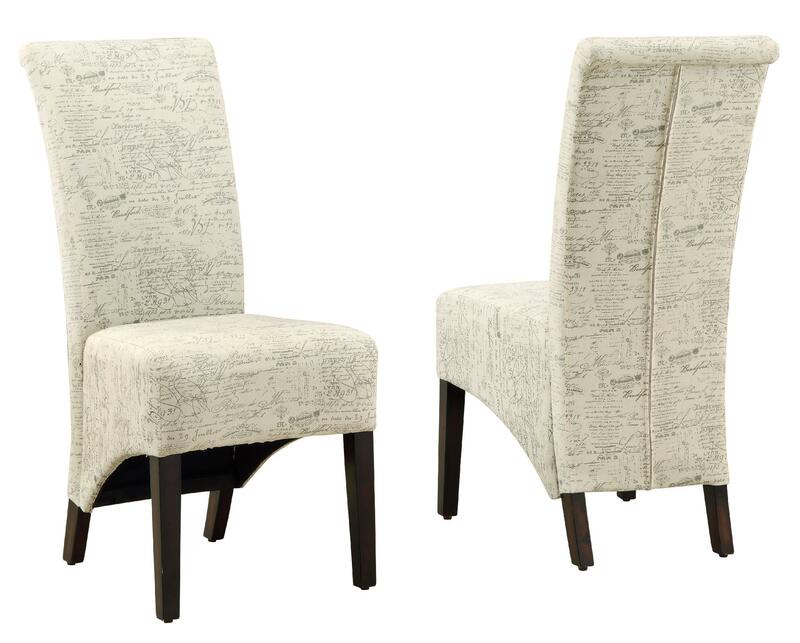 Pair these armless side chairs with one of our contemporary style tables for a fresh updated look in your dining room or kitchen area. Assembly is required. 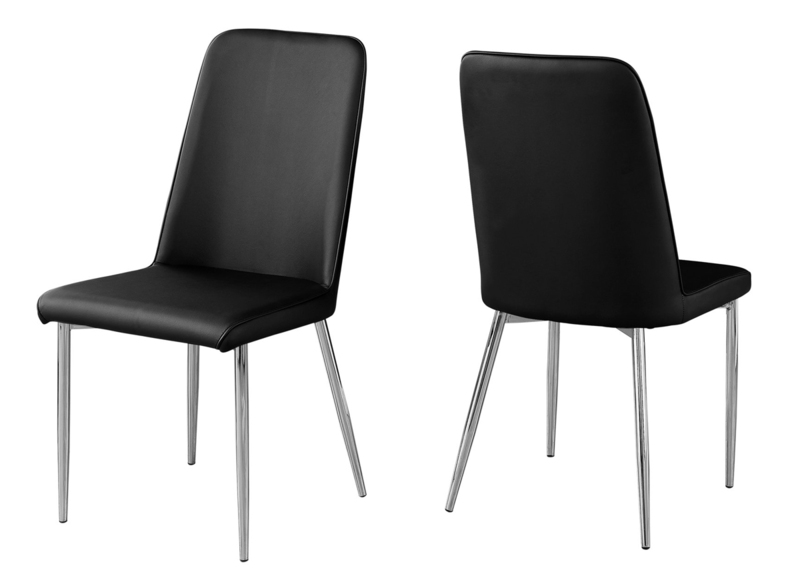 This set of 2 retro style dining chairs is given a sophisticated modern update! 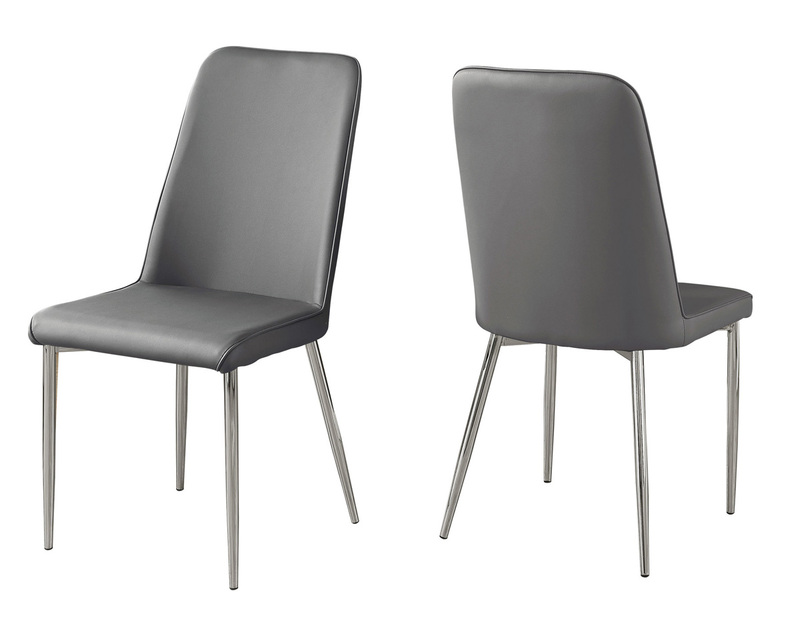 Upholstered in a chic grey leather-look material with a supremely cushioned seat and slightly curved supportive back, together with sturdy chrome metal legs will bring instant style to your contemporary dining room or kitchen space. Pair this sleek set of side dining chairs with a variety of table options or even as accent chairs for other rooms in your home. Combining contemporary design and classic styling, these parson chairs will help create a transitional and luxurious feel to your dining room. The high profile 41" high backs, solid wood legs in espresso finish and a traditional french writing upholstered chair fabric. These stylish side chairs compliment the look of the dining table with generously padded cushioning vertical slat back design and matching dark cappuccino finish. 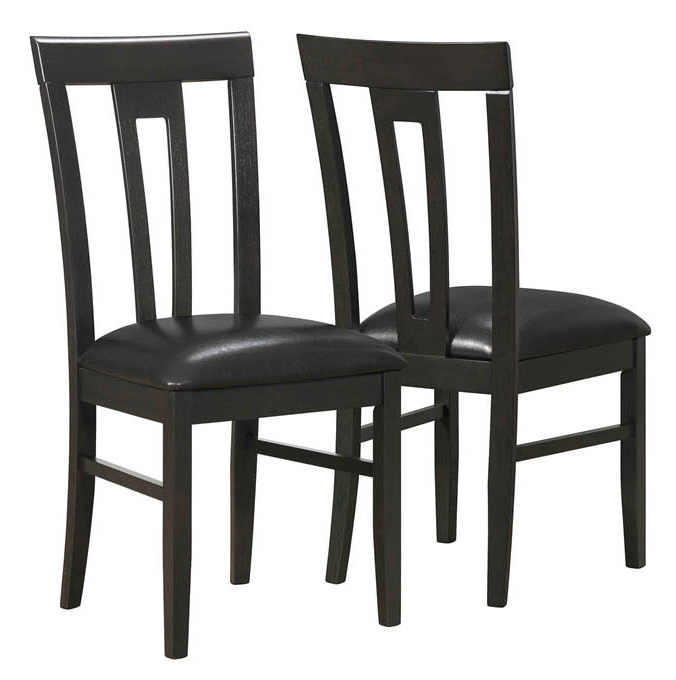 Built for comfort and convenience these chairs will be the focal point of any dining room. Bring a touch of modern elegance into your home with the clean design of these contemporary black leather look dining chairs. Featuring a soft quilted seat and back and sleek, sturdy chromed metal legs these chairs will easily have you dining in style.